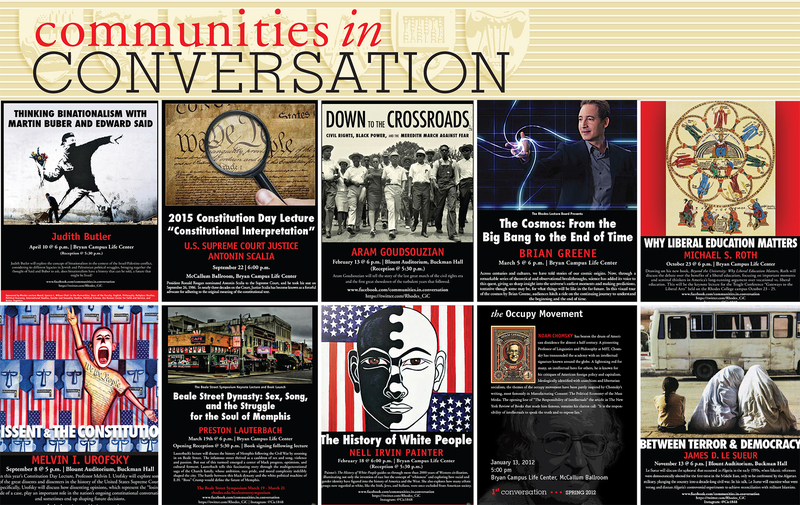 Communities in Conversation, the signature lecture series at Rhodes College, provides a forum for dialogue on a variety of topics in the humanities, as well as those related to current affairs. Annually, we host 8-10 keynote lectures, symposia, conferences, and film series. Each of these events offers a lineup of nationally recognized scholars and intellectuals discussing key topics in the humanities and the broader culture. Past speakers include Supreme Court Justice Antonin Scalia, Brian Greene, Ta-Nahesi Coates, Judith Butler, Nell Irvin Painter, and Colson Whitehead. For more information on upcoming events, be sure to like Communities in Conversation on Facebook and follow us on Twitter. If you can't attend a lecture, view the recorded lecture on our YouTube channel. Many of our lecturers have also appeared as guests of Dr. Judaken on Counterpoint, a monthly radio broadcast on WKNO-FM, NPR for the Mid-South, which puts a spotlight on the role of scholars, academics, and intellectuals and how their work illuminates the issues we face locally and globally.